Katy Huff, Assistant Professor in Nuclear, Plasma, and Radiological Engineering at Illinois, is the 2017 winner of the American Nuclear Society Mary Jane Oestmann Professional Women’s Achievement Award. Huff speaking at PyCon 2017. 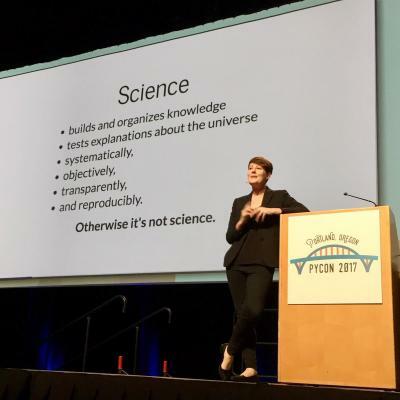 PyCon is the largest annual gathering for the community that uses and develops the open-source Python programming language. This is the third year in a row that NPRE faculty members have gained the national distinction. Clair Sullivan, who was with the department from 2012-2017, won two years ago. Zahra Mohaghegh, also an Assistant Professor in NPRE, won in 2016. The award recognizes outstanding technical achievement by a woman in the nuclear industry, and Huff will be officially recognized October 30 at the ANS Winter Meeting in Washington, D.C. A computational nuclear reactor physicist who joined NPRE in 2016, Huff has been cited for her tireless work to increase the adoption of modern, open source software development practices across the nuclear engineering community. Huff has been instrumental in the work of the Software Carpentry Foundation, which holds workshops teaching best practice computational skills to researchers in science, engineering, medicine and related disciplines. In addition to leading in the organization of the workshops, Huff, co-wrote a book, Effective Computation in Physics, offering a long-form companion to the two-day workshop curriculum. Huff has been extremely active in ANS since her student days, and was recognized with the 2016 Young Member Excellence Award for her involvement. She currently advises the ANS at Illinois student chapter. The student organization honored Huff earlier this year with the 2017 NPRE Teacher of the Year Award. Huff earned a bachelor’s degree in physics from the University of Chicago in 2008, and a PhD in nuclear engineering from the University of Wisconsin-Madison in 2013. Her PhD advisor, Paul Wilson, Grainger Professor of Nuclear Engineering, nominated Huff for the Oestmann Award. Prior to joining NPRE, Huff worked as a postdoctoral scholar and data science fellow in the Nuclear Science and Security Consortium and Berkeley Institute for Data Science at the University of California-Berkeley.